The weeks recently have been a mismatch of crazy hours at work, that aforementioned tube strike and some spontaneous meals in new (and some not so new) places. A couple of weeks ago, I went to Grillshack. I'd been heading for Flat Iron but knew the risk of a queue to be far too likely and it was too cold to be jigging around outside. We wanted a meat fix (L's trying the Atkins diet out) so my immediate thoughts of Spuntino or a naughty burger went straight out the window. Described as a modern take on the traditional American diner, Grillshack's sprung up in the heart of Soho and seems to be fairly busy. All white subway tiles with a snazzily little decal explaining how it works, this place looks quite good on paper. But in reality, I was left cold. The waiting staff were a little distracted, the 'serving yourself' process wasn't as slick as it should be and the food was disappointing. 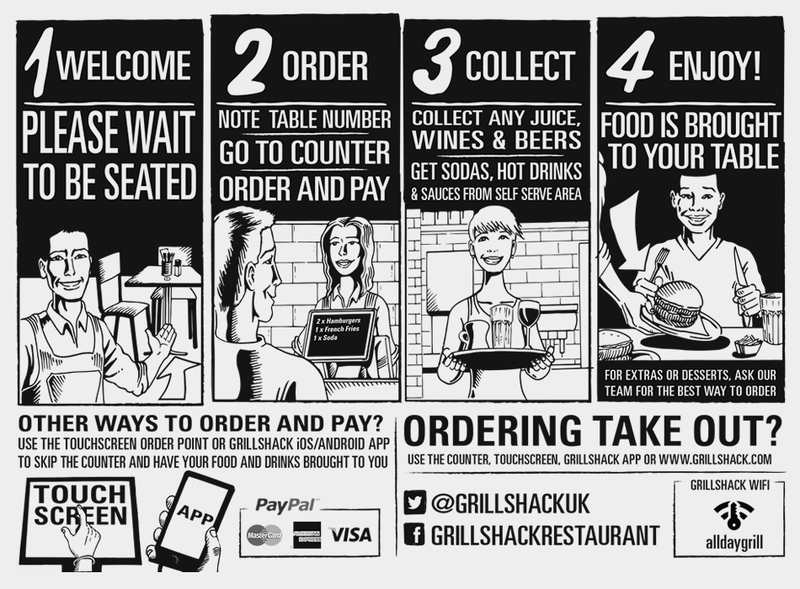 With a very small menu (and calling itself Grillshack) you'd expect the steak to be bang on - as it's flattened to within an inch of it's life you can only have it served medium. Ouch. And flavour? What flavour? The radish slaw was watery and the fries weren't great. The only redeeming factors were the green olives and the price - unbelievably cheap - but these definitely aren't enough to deserve a return visit. Now Dean Street Townhouse is a funny one. It's a beautiful building inside and out, always busy and the staff are all good at what they do, but I feel that there's always a slight mismatch with the food. The menu is classically British, but don't go expecting any contemporary cuisine, as you're more likely to find 'mince and potatoes' and 'chicken and mushroom pie' over any foams and flambes. We went for a work lunch with a client and dove straight into the warm homemade bread and salted butter, before I went for the roasted cod with monk's beard and chanterelles. It was divine, with the fish perfectly flaking to melt in the mouth. The salty sauce, monk's beard and chanterelles added some different textures and I even resisted my boss's fat chips to go for the sprouting broccoli. It was an understated but great dish, I just can't help but wish there was more life to the menu as this place is right up my street. This was a rather spontaneous choice from my boss's boyfriend fancying Moroccan/Lebanese food. There's not a huge number of places who serve up these Arabic favourites so we ended up at La Maison Touareg on a quiet Wednesday night. Inside, the decor is an opulent deep red and dark wood, rugs cover the floors and there's mandala patterns all over the place. We started with mezze to share - houmous, tabbouleh, calamari, falafel, baba ghannouj (to die for), illakenek (grilled spicy sausages), kofte nleshwi (grilled minced lamb with herbs) and lashings of warm pitta. Small but moreish, these were the perfect entrees. The boys went for the lamb tagines and cous cous for mains - all aromatic and served in authentic terracotta ware - and the meat slid right off the bone. I'm not the biggest fan so stuck with more mezze and feasted away; it seems that London's love of small plates suits me right down to the ground. The waiting staff were a bit fumbly and confused (bringing us the wrong wine and dishes at the wrong time) and there wasn't much atmosphere to speak of on a blustery Wednesday night. Apparently belly dancers spice things up at weekends but I don't think I'll be going back.